Sasha Danilov. . . Honored Artist of the Republic of Moldova, a brilliant modern master of clarinet, has acquired popularity on both sides of the Atlantic. 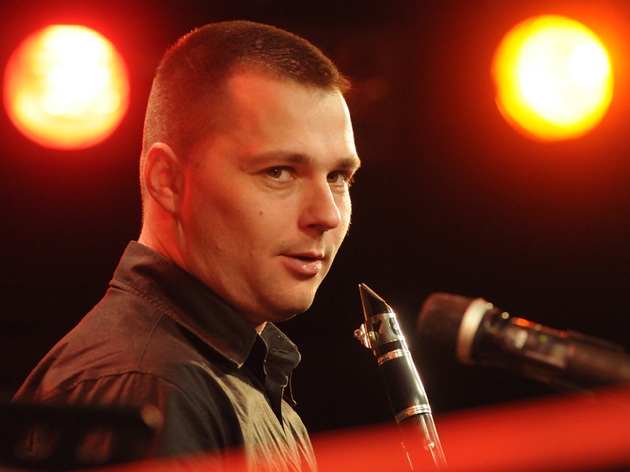 Born October 29, 1976 in Tiraspol (Moldova). He graduated from music school accordion and the College of Music in clarinet class. In 1995 he entered the Academy of Music in Kishinev. In the period from 1998 to 2000 - a soloist of Radio and Television Symphony Orchestra of Moldova. Along with classical music since 1996, began to study jazz. In 2000 has finished ACADEMY OF MUSIC and in 2005 POSTUNIVERSITY at the Department of chamber ensemble . 2010 graduate ACADEMY OF PUBLIC ADMINISTRATION UNDER THE PRESIDENT OF THE REPUBLIC OF MOLDOVA specialization Constitutional and Administrative Law. Has been the MASTER DEGREE IN LOW. Since 2014 lives and works in Vienna. 2015 - in cooperation with Roman Grinberg founded "VIENNA KLEZMER ACADEMY". Since 2015 - conductor of "VIENNA KLEZMER ORCHESTRA". Since 2016 - Professor at the Franz Schubert Conservatory in Vienna. Seit 2016 - Professor des Franzschubertkonservatoriums in Wien. Given concerts in the cities of Russia, the Ukraine, Moldova, Byelorussia, Latvia, Lithuania, Estonia, Tatarstan, of Romania, Hungary, France, Greece, Turkey, Italy, Israel, Germany, Poland, The Jewish autonomous Oblast, Czechia, Slovakia, Croatia, Austria, Belgium, the USA, Mexico, Venezuela and Canada. © 2019 Sasha Danilov. All Rights Reserved.